This cottage is part of an authentic building, which provides space for an additional three other cottages. The huge area is home to a large, enclosed communal pool with partially covered terrace with garden furniture and sunbeds. A lovely spot to enjoy on a lounger by the rest. 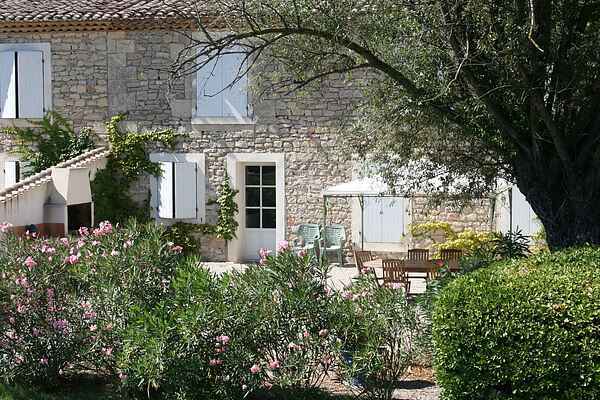 The house has an enclosed private garden with a private terrace, furniture and a stone barbecue. You have plenty of privacy. If we look at the inside of the house, we see very well kept and cozy interior, decorated in yellow tones. You are fully equipped. A nice starting point for exploring the exciting environment! St. Laurent-d 'Aigouze is a small village in the beautiful Camargue, a region where daily life is influenced by many traditions. Also visit the surrounding attractions such as the medieval town of Aigues-Mortes (8 km) or the cities of Montpellier (30 km) and Nîmes (30 km), with behind the Cevennes. Whether the old port Le Grau-du-Roi and aquariums in Port Camargue, where more than 300 species of fish to admire zijn.Natuurlijk there are the famous seaside resorts La Grande -Motte (10 km) and Saintes-Maries-de-la-Mer (20 km).